As arguably the single most devastating threat to humanity, global climate change was one of the first issues on the Davos agenda on Tuesday. 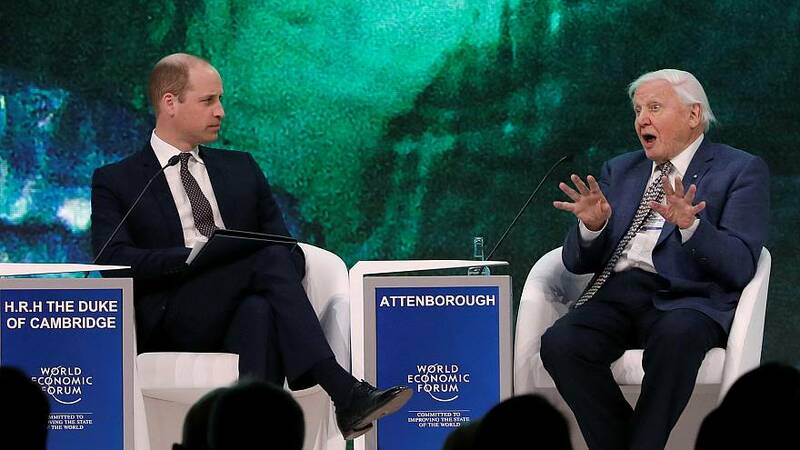 In a discussion with the Duke of Cambridge, the veteran British naturalist and broadcaster Sir David Attenborough gave world leaders a stark warning: “The future of the natural world is in our hands, so if we wreck it, we wreck ourselves." “Care for the natural world and treat it with respect and reverence ... in the future, we (nature and humans) are bound together,” he added. Attenborough accepted the 25th Crystal Award in Davos on Monday evening, when he again warned about tackling the climate crisis. “The Garden of Eden is no more,” he said. Making his first international visit outside Brazil as president, Jair Bolsonaro, made a speech to attendees, touting “a new Brazil” open for business. The former army captain said he was going to make Brazil one of the top 50 most competitive places to do business, while also tackling corruption in the country. His comments on balancing “environmental protection with economic development” have already raised some red flags among other Davos attendees, including Jennifer Morgan, Greenpeace International’s executive director, who called on the president to safeguard the Amazon rainforests over short-term business profit. British Prime Minister Theresa May may have pulled out of attending Davos this year but that didn’t stop Brexit surfacing in discussions on the first day. He added that he thought “this pattern of disruption” was “a positive development.” Pompeo also credited this “unleashing of animal spirits” for keeping the US economy in good health while the world faces a slowdown. Taking part in a panel discussion with former US vice-president and environmentalist Al Gore and Sir David Attenborough, Jacinda Ardern told attendees and Britain's Prince William that just 10 years ago, she was booed by opposing politicians — and even castigated by her own family — for her views on climate change and the environment. The Duke of Cambridge wasn’t the only royal in town. Princess Martha Louise of Norway joined a panel to discuss the role of women in the world and how to empower them to reach their full potential. She added that women should go back to the female strengths of connecting and building communities, for which the support of men was necessary. “And that is what is going to change the world,” she concluded. Davos is widely seen as a meeting of the elites and a report by the Guardian suggested there are expected to be a record-breaking 1,500 private jets flying in and out of airfields serving the Swiss resort this year. Ironically, many attendees are flying in to hear such speakers as Sir David Attenborough calling for urgent action on climate change. As world leaders and the CEOs of major businesses and corporations roll into Davos, they are naturally closely followed by the world’s media who are covering this unique global summit. With the mercury dipping as low as -12 Celcius, the Euronews team faced the cold to be in the thick of the action. Business editor Sasha Vakulina gave us a glimpse behind the scenes reporting on the first day of the World Economic Forum. Intending to keep a low profile amid the ongoing Brexit deal crisis, it has emerged seven UK ministers are to attend Davos meetings this week in what has been slammed by Labour Shadow Minister Jon Trickett as "tax-payer funded freebie to sip champagne with the global elite."